Availability: This product is discontinued and no longer available for purchase. 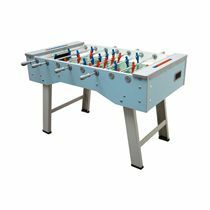 For alternatives browse our Football Tables department. The Garlando G-2000 Evolution shares many of the features of the popular G-500 Evolution Line. The primary differences are the shape of the cabinet an d the slanting legs. 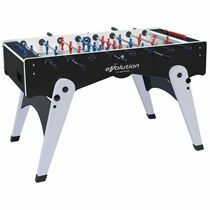 The Evolution line offers a new more hi-tech and glamorous effect providing a new evolution finish with a tasteful aluminium and black combination. Legs: 40mm thick MDF slanting legs with silver melamine coating. Levellers enable a ideally flat playing field on uneven floors. Goal: Quick and easy ball recovery through an exit behind each goal. Fantastic table. Very solid construction - feels like it will last a lifetime! 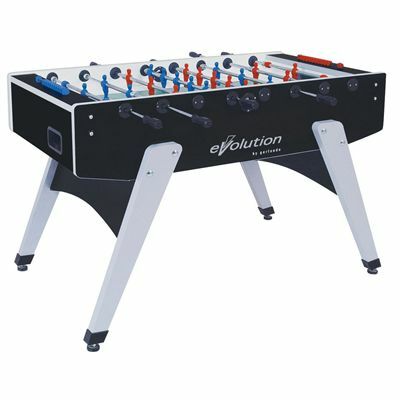 for submitting product review about Garlando G-2000 Evolution Football Table with Telescopic Rods.